"Nothing has to be reached, everything can change." Welcome to the website www.resonanzlehre.de! This is an English introduction to Resonanzlehre, Applied Physiology of Music. The text was written in February 2017 in London and is dedicated to the international community of musicians. The Art of Resonance or Resonance Training or Resonance Practice or just Resonance. I´ve been practicing Resonance Training over 27 years with musicians from all over the world. And for 27 years people have asked me: "What is Resonance Training?" Resonance Training for musicians is a musical sound body practice to enhance quality of sound, freedom of movement and richness of emotional expression. Quality of sound means that the musician realises the sound quality s/he wishes to appear in the room. Freedom of movement means lightness in the movement and full ability for the musician to respond and react to the sound as it is. Richness of emotional expression means that how the musician feels the music is fully represented in the sound waves at the ears of the listeners. In Resonance Training it is important to look at the relationship between sound and movement and we call this sound body practice. This is not simply another body work or technique for musicians, rather it´s about the integration of sound and movement to create effortless music-making. "The more resonant the sound, the freer the musical movement."" You can tell the condition of a musician´s body from the resonance quality of his sound. A sound which has poor resonance reveals muscular tension in the body. A sound which has rich resonance reveals a body which has balanced muscles, not too tight and not too relaxed, and moves in a quality of free flow. A sound rich in resonance has a lot of overtones and a lot of undertones, all of which are represented in the performance space and evoke a deep sense of resonance in the listener´s body. Resonance Training is for instrumentalists, singers and conductors. 1. to show musicians how to move in a way that tension, cramp and pain don´t arise. 2. to enable musicans to find their own unique quality of movement which can release their musical-artistic potential. Resonance is the main principle of Resonance Practice. If you play an instrument, there are four factors of resonance: Body, instrument, room and audience. All four factors need to be integrated and need to resonate whith each other. There are also four aspects of perceived resonance: spectrum, volume, intensity and duration. Spectrum refers to the overtones and undertones in the sound. Volume takes into account the size of the area in the room in which the sound resonates. Intensity refers to the intensity of the vibration, which can vary. Duration is an aspect of reverberation and indicates how long the resonance lasts in the room. "The easiest way to move a mass is to move it over its centre of gravity." This means that the whole body is moved from its centre of gravity which is in the middle of the pelvis. Parts of the body, for example the arms, are moved from the centres of gravity of the parts. In the case of the arms, these are a little bit below the elbow in direction to the hand. Lightness is not only about the body though. Sound itself is a very light material, it is just vibrating air. Therefore, effort in music making is not appropriate to the nature of sound. What is music? Of course, there are many possible answers to this question. Feruccio Busoni answered this question with the famous quote: "Music is vibrating air." In Resonance Training we say: "Music is emotion as sound wave." How the musician feels the music has to be realised as evenly vibrating air which travels to the ears of the audience. Sound waves have a physical characteristic, they move in an amorphic ball form, a sphere, from the source of the sound, for example a violin, into the room. An amphitheatre has the ideal shape for sound waves to travel through the space. The Berlin Philharmonie and even more the Chamber Music Hall of the Philharmonie are constructed in a shape that optimally responds to the nature of sound wave movement. To represent sound waves in a room, a musician should have a representation of a spheric form in his movements. This can be realised through a mixture of pendular and circular movements, which gives roundness in the movement quality. In Resonance Training we create instrumental mobilés, for example a cello mobilé, a violin mobilé, a flute mobilé, a piano mobilé, or a singer mobilé, or a conductor mobilé etc. A mobilé hanging from the ceiling has a circular pendular balance structure. The body of a musician should be a standing or sitting circular pendular balance structure. This supports roundness in the movements and organises the movement in accordance to the movement quality of sound waves. If you pull at any part of a mobilé, every part of the mobilé reacts and integrates the movement. The same thing can happen within the movement quality of musicans. You can see this structure of sound supporting movement for example with viola player Tabea Zimmermann, pianist György Sébök and conductor Carlos Kleiber. The physiological background for the organisation as a moving mobilé is that the ear is connected to every muscle in the body through the balance organ. Hearing organ and balance organ form a physical and functional unit. The more balanced the musical movement is, the easier it becomes for the musician to translate sound information into appropriate movement. Sound waves are inconsistent, like water or clouds, for example fleecy clouds. Sound waves react differently to different environments. When you prepare a piece of music at home to a very high quality and you want to play the same piece at the same high standard in another room, every movement has to be different. Many musicians want to play like they did at home but this never works. It´s simply not possible to repeat the same musical movement in a different environment and have the same quality of sound. Just as it is impossible to spill out water out of a glass in the same way every time, it is impossible to repeat any sound movement. A musician with musical muscles is able to respond adequately to the sound as it is, and can therefore influence the sound as s/he wishes. We have around 650 muscles in our body. The question is, does every muscle respond to sound, or is it just the muscles you are conscious of, which are required technically to play the instrument? Resonance Training is not a relaxation technique. In Resonance Training you learn to adjust both positive tension and relaxation as required by the music. The most relaxed player - I call them the soft-boiled spaghetti player - is not able to perform his best music because music-making usually needs positive tension. Positive tension can be released when it is no longer required because the music changes. In general, musicians need a mixture of robustness and sensitivity in the muscles. Sensitivity is needed to realise the subtle differentiations in the movement, depending on the different requirements of the music. Robustness is needed to generate a feeling of trust on stage. In the end free musical movement is all about differentiated adjustment of elasticity in the muscles. In Resonance Training we recommend doing sound body exercises on a regular basis. The principle of the exercises is that you move the whole body over the centre of gravity, and the individual parts of the body over their specific centres of gravity. This creates a moving mobilé with a quality of effortlessness and continuous flow in the movement. In other words the flow of movement can correspond with the flow of music. We begin the exercises with the two foundational positions of music making, standing and sitting. There are also all other forms of human movement represented in the exercises, like lying, kneeling, walking. Once you have started this training process, it is possible to learn to move your body in a musical way for every situation or activity, even when brushing your teeth, cutting bread or drinking tea. One astonishing new thing in Resonance Training is that it is possible to make musical movement without explicitly making music. Musical movement can be incorporated into the movements of your every day life. Being on stage therefore becomes a continuation of „normal“ life, you go on living. One basic effect of doing the sound body exercises is to move in such a way that tension, cramp and pain don´t arise. In a completely balanced muscular system a musical effect arises, this is plasticity of movement. Plasticity of movement means that the musician is able to compound a mixture of movement energy from all dimensions of the body. Plasticity of movement corresponds with plasticity of listenig and plasticity of sound in the room. Through the sound body work of Resonance Training musical movement becomes an embodiment process. It is like an on-going manufacturing of the body as an instrument. How you move is how you sound. If all muscles have a quality of musical responsiveness, you can focus on the sound. The main thing with musical movement is that the focus should not be on the movement, it should be on the sound. In Resonance Training we want to develop a practice of immediate sensing-acting or sensing-reacting. Therefore we see awareness of making music as a hindrance. Awareness is a kind of knowing the sensing. Music itself is ongoing flow of sound. Knowing stops the flow by analysing what´s happening. Many musicians play music and in the same moment they want to know how music-making works. Even John Cage said that performing music and analysing the process of making music are two different things. To analyse the process of music-making is not bad, but should not happen when playing music. It´s just a transient period of practicing and should happen out of the sound situation, if necessary. Generally speaking though, sensing is enough for making music. Play is the ultimate form of making music. Looking at the music world in our days you can see that playing music often has become working music. Working music creates an obvious or subtle kind of resistance in the muscles. Playing supports free flow of movement. To be a player is a forgotten role model for musicians. Playing supports music-making at its best, particularly in terms of musical craftmanship. Resonance Training enables musicians to be players again by organising an organic bodily approach whithout resistance and fight. A fundamental requirement of Resonance Training focuses on breathing, with the aim for this to be entirely free flowing within the body. Muscles need oxygen to function optimally. Oxygen is the petrol for the muscles. Indeed, this is an underlying precondition for a craft that supports the musician´s sense of trust. One important body feeling for a free flow of breathing is to allow that the body permanently varies the form. Musicians who can breathe with such freedom are rare to find. So how should you breathe when making music? "Breathing follows the movement, movement creates the breath." Allow that the air you breathe comes in and out effortlessly as the movement requires it. In this way movement and breathing are not two different things that fight each other. Instead they are completely integrated proceedings which support each other. For wind instrumentalists and singers the principle above is important when not actually playing music. This way you´ll always have an optimum quantity of oxygen in the muscles and your breathing quality can be easily enhanced. When you play music it is important not to breathe against a motionless body. Don´t breathe against the body, breathe with the movement of the body. The best quality of movement to support a free flow of breathing is a continous open balance flow. Another consideration for wind instrumentalists and singers concerns the elasticity of the muscles in all parts of the body. As part of Resonance Training we have created a special training which focuses on breathing throughout the body down to the soles of the feet. Play like a professional, listen like a child, and you get the quality you want. Listening is the most obvious thing musicians need to do. So obvious that the quality of listening is mostly overlooked. Professional listening can often be a kind of criticism which can disturb the performance. As we say in Resonance Training: "Criticism inhibits resonance, and resonance inhibits criticism." If you want to listen like a child first listen to the background noises in the room, for example the sound of a heater or a neon lamp or whatever is in the room. Then listen to the music as you listened to the heater. Did you criticise the heater? A metaprofessional player is a musician who leaves behind all the limitations from both the professional and amateur worlds. The metaprofessional player leaves behind all the restrictions and disruptive rules s/he may have learnt, especially in the realm of professional music-making. Pianist György Sébök said: "To learn means to forget." Don´t forget to forget. Be careful, perhaps you might suddenly become a happy musician. Especially in the realm of classical music the audience is mostly put on an emotional diet. Sometimes there are some special moments of emotion in a concert, and that´s it. Often music making brings out examples of dedication and a kind of emotional simulation through emotional templates. But does the audience really receive how the musicians feel the music? In Resonance Training we want to create a consistent stream of emotions in the sound waves for the whole piece of music. One key question is, how do the musical emotions of the player come into the soundwaves? The emotions of the player have to become vibrating air. Many musicians have strong feelings for music, but often they are held back within the players bodies. First you have to be clear about the fact that the emotions have to come into the air. It´s not you who has to be emotional, the air has to be emotional. This means you have to give away the emotions, and spread them into the room as sound. And then, how do you create musical emotions? Expression of emotions is a dangerous word in music-making. Sometimes I have the impression that an empty toothpaste tube is pressed out. Expression in music is nothing you have to generate. Musical expression happens by trusting your musical expression. This means to create a process which connects three realms of emotions through resonance. Firstly there is the emotion of the piece of music, you may say the composers emotion. Secondly there are your feelings for the piece of music. Thirdly, mostly overlooked, there is your actual emotional situation in life, and it is this which keeps the expression of emotions always fresh. Allow these three realms of emotions to resonate with each other. When it comes to performing, many musicians have the intention to do their best. But is this music? In my opinion the most beneficial intention for making music, also in terms of optimum functioning of the muscles, is the following: "How I feel the music, that´s what I bring to the ears of the audience." That is what music-making is about. And why not have an intention which is connected to what music-making is about? If you have this intention, remember: "Intention is enough." So now, what to focus on in a performance? Don´t try to recall what you have trained while practicing. Make just small changes in sound and movement that are easy and make the sound more resonant and the movement more elegant. Then you´ll have joy and you´ll be absorbed making the changes you want while playing music for an audience. Some musicians have a special relationship with the audience, it is an important factor of their performance. Even in an audience of a thousand people you have the feeling that the musician is playing for you. How the musician feels the music connects very directly with the audience. This creates feelings in the audience which go back to the musician, which in turn creates a unique mixture of emotions within the sound waves in the actual situation. Therefore a concert with the same programme in different towns is always different, because of different emotions in the audience. Acting teacher Lee Strasberg said: "The audience is the sound board of the actor." Visual artist Marcel Duchamp said: "The artist performs only one part of the creative process, the onlooker completes it." Coming back to the realm of music performance, a resonance player develops a responsiveness not only to the music and his emotions to the music, the resonance player even responds to the emotions which are coming out of the audience. This is resonance resonance fulfillment. Born in 1960, Thomas Lange studied violin with Prof. Saschko Gawriloff and Prof. Thomas Brandis in Berlin and Prof. Gérard Poulet in Paris. He played for 10 years in professional orchestras, e.g. Deutsches Symphonie Orchester Berlin and Berliner Philharmoniker. He was artistic director and conductor of Brandenburg Chamber Orchestra Berlin. He has a long-term experience in the field of jazz and free improvising music. He gave concerts as violinist and conductor in Germany, Austria, Italy, France, Spain, Ireland and South Africa. As a Resonance teacher he has taught musicians of all instruments, singers and conductors from all over the world for more than 27 years. Many of his students hold positions in leading orchestras of Germany, such as NDR Symphonie-Orchester Hamburg, NDR Radiophilharmonie Hanover, Staatskapelle Dresden, Bayerische Staatsoper München, Münchner Philharmoniker, DSO Berlin, Staatskapelle Berlin, Berliner Philharmoniker. He has taught at music universities such as Universität der Künste (UdK) Berlin, Hochschule für Musik Frankfurt/Main and Hochschule für Musik Hannover in cooperation with the Institute for Music Physiology. 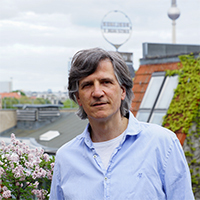 He is Director of the Resonance Teachers Training Institute in Berlin. He frequently appears as a guest conductor, often incorporating Resonance Training. He has led courses with various Orchestras, e.g. Orchestra of Hessisches Staatstheater Wiesbaden, Orchestra of Schleswig-Holstein Music Festival, Cape Town Philharmonic Youth Orchestra and NDR Radiophilharmonie Hannover. The musicians of NDR Radiophilharmonie Hannover evaluated his course as "by far the best of all courses around musical body work that has ever been delivered in the context of NDR."